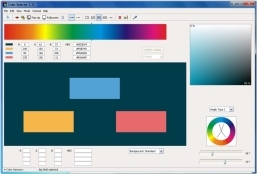 The elements of the Color Selector are arranged in such way that a chosen color combination can be judged clearly and quickly before you integrate it into a layout. With the help of the Color Selector you can obtain 2-color harmonies, 3-color harmonies, 4-color harmonies, fannings and color rows. It is of course also possible to put in individual color combinations. Take Color Selector for Harmony Contrasts for a spin to see what it's all about!